Photo courtesy of Pentacle Boston Showcase 2018. Artists face many kinds of challenges in this frenetic modern world – financial, creative and more. Yet there’s strength in numbers; pooling resources allows for the mutual support that can make all the difference. That pooling starts with connections – sometimes between individual artists and groups, sometimes between organizations. Necessarily, those connections look and feel different, but the goals and outcomes are most often similar. 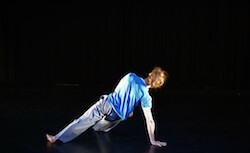 Such connection between artists, at both sorts of levels, was clear in The Pentacle Gallery Presents at the Dance Complex (Cambridge MA). Peter DiMuro, Dance Complex executive director, gave a pre-show introduction. He shared that The Pentacle Gallery and The Dance Complex have had a partnership for a number of years, the kind of partnership that catalyzes artists offering each other mutual support – the kind of support that artists and arts organizations need to thrive. 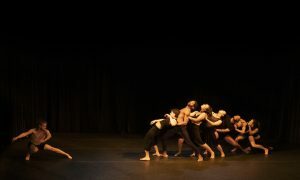 The night included six dance pieces, all thoughtfully constructed and beautifully danced in their own ways. This review will offer an in-depth look at two of those works. 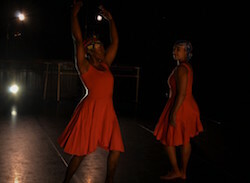 Hair Ties was from Movement of the People Dance Company, and choroegraphed by Joya Powell. It was a multimedia feast – as the program notes described, “a celebration of Black beauty, creativity, and ingenuity.” Four dancers walked in slowly and mindfully, looking around in curiosity. They began moving – with an earthy and grounded quality, yet with raised hearts of hope. Beautifully lifted attitudes also dynamically contrasted that earthy feeling. Traveling ronde de jambes and powerful battements with flexed feet also showed that compelling dynamic contrast. The dancers were clear with all of these level shifts. Their red orange dresses matched the scarves they pulled from their buns, which they wrapped around their heads as head scarves. 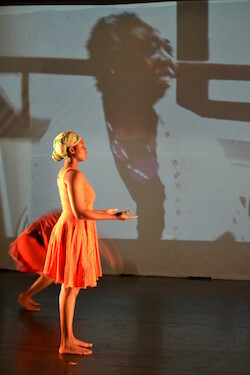 Video projection more clearly and specifically illustrated this theme of the beauty – yet social control – of black women’s hair and overall bodies. Videos of these black women offered diverse portraits of the black female experience (within a common identity are many different experiences) – some quite joyful and humorous. Again, diversity and complexity of experience was clear. Also dynamic was use of the stage; partly because of staging, partly because of the dancers’ expansive ways of moving, they fully covered the stage terrain – back to front, side to side, diagonals and more. 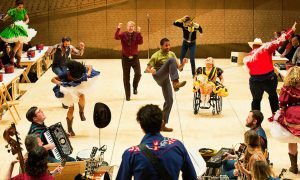 A fun, jazzy tune led them into faster and even more joyful movement. Playful and inventive uses of their scarves, such as tying it around their shoulders, fit well with this jazzy style. One took off her head wrap to then wrap it around her shoulders, exposing her hair and defying the pronouncement of one of the women in the videos – how she learned that one must never be in public “uncoiffed” (hair not done). At first, there was a tension in her body and physical demeanor, yet she grew more comfortable. As the two other dancers joined her in removing the head scarves, she became more comfortable. They all danced together with joy and ease, in their fullest and truest selves, to end the piece. 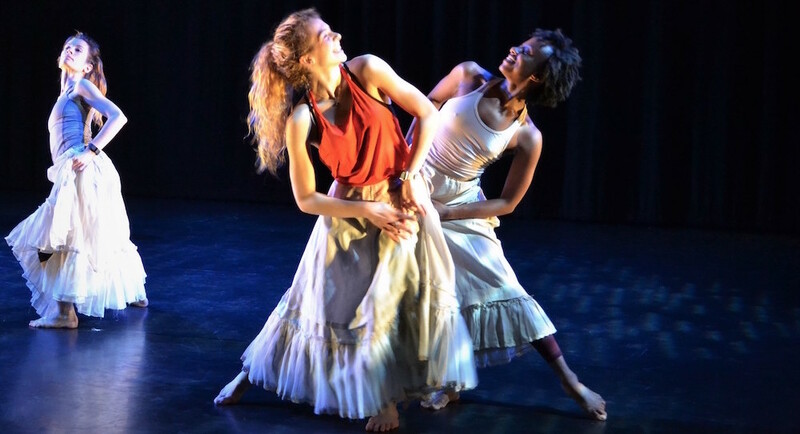 Schoen Movement Company‘s Every Day – A Duet, choreographed by Emily Schoen, ended the show. Similar to with Hair Ties, specificity allowed its meaning to be powerfully universal. It began with two dancers, Jack Blackmon and AJ Parr, sitting together at a table. Cups and plates lay on top if it, and there was a score of the chatter of multiple simultaneous conversations. It was a restaurant, and we were seeing a snapshot of one set of guests there. Simple movements of reaching up and back, along with shifts and circling of the torso, conveyed social dynamics. Moving the table with their feet allowed them to change where they were on stage, a clever way to add some spatial variety in this section of staying at a table. 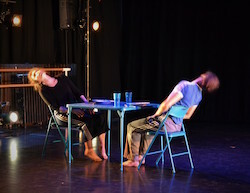 Certain moments brought a sense of apprehension: a foot to the side and the torso leaning the opposite direction, with the duet partner taking the same the other way, ducking under the table with one leg cutting through in a ronde de jambe movement. With one dancer flipping over the table, the action soon became adversarial. They both stood in stillness, facing each other, until she began to put the table and its contents back to nicely set. He remained standing. As a performer, it takes courage to be simply present in space – minus any action – for an extended period. As it does to do mundane movements. These two performers demonstrated that kind of courage. Blackmon danced a solo of ease and grace. Stop-and-go dynamics added rhythm to sweeping extensions and grounded turns. Parr returned, and they turned in a circle together, with foreheads joined. They turned around to do the same with their backs together. No matter what might have happened, or happen, a connection between would remain. Parr followed with a solo of fast, athletic movement, illustrating her strength and conviction. They came together to dance one last section. The varied dynamics of time and space within the movement captured the tensions between varied emotions and convictions in relationships. They returned to dancing under and over the table, echoing the piece’s beginning. They picked up the table and walked off. It was a simple yet astute reminder of how we carry moments in relationships with us, in our emotions and in our patterns of behavior. 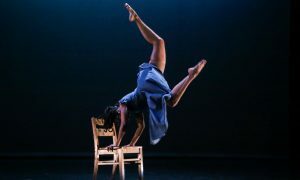 Alliances – of artists within The Pentacle Gallery, of The Dance Complex and Pentacle, of these skillful choreographers and dancers, and more – allowed all of this to come forth that night at The Dance Complex. A post-show gathering carried this further, artists chatting and exchanging information to keep in touch. I know I made contacts I hope to support, and perhaps be supported by when I may need it. In a world where the arts receive all too little support from the outside, we can build it to be stronger and better by creating it from the inside.